Genuine antique decoys, or skillfully carved and painted reproductions? Only a trained eye can tell. They say birds of a feather flock together. And, in this case it is true. Jan Avery and Syd Wood complement each other’s skills as, together, they carve and paint beautiful duck decoys. But, that’s not the way it started out. They each had to develop their skills before they met on the internet. 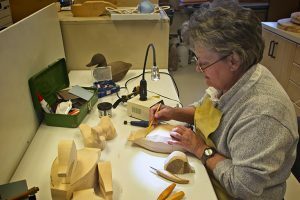 She’s been carving waterfowl decoys in Colorado on and off for more than 30 years. Among those are some thoroughly modern decorative decoys — intricately painted and scrupulously detailed right down to individual feather barbules. However, her real passion is replicating the rustic, working-class decoys originated by the master Chesapeake Bay and New England carvers during the heyday of American waterfowling near the turn of the 20th century. Now, as any duck hunter will tell you, there’s nothing new under the sun where using decoys to lure ducks, geese and other wild game to their guns is concerned — or to their nets, spears and bows, as in the case of the ancients. Hunters have decoyed ducks and geese for centuries. In fact, scientific evidence shows Native American hunters have used decoys for at least 1,800 years, and likely longer. Archaeological testing on a dozen duck decoys discovered in a cave near Lovelock, Nevada, in 1911 indicates they were made by Native Americans living on the Colorado Plateau during the Archaic Period some 2,000 years ago. Meticulously woven from tule reeds, some of them adorned with feathers and bird skins, they are still considered the oldest known decoys in the world and are on display in the Smithsonian’s National Museum of the American Indian. Time and technology have seen duck decoys evolve from primitive, reed-and-mud concoctions through various stages of design and development to modern-day injection-molded plastic imitations so remarkably life-like they look as though they could rise up and fly. Interestingly, while today’s mass-produced, lifelike decoys are preferred by most modern hunters, wooden decoys are considered a unique and truly genuine North American folk art. 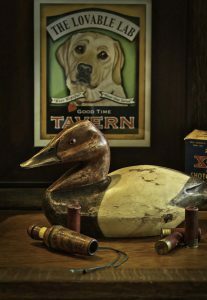 Those old, hand-carved ducks, geese and shorebirds from the golden age of waterfowling, with their rustic charm, muted colors and elegant grace, have become sought after by field sport historians, collectors and connoisseurs — and the inspiration for modern-day carver/artists like Avery. 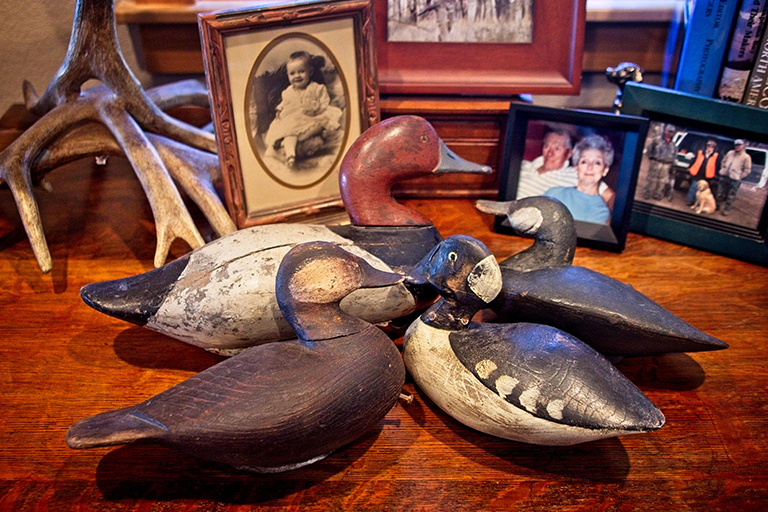 But just as styles in decoys evolved over the years, so did Avery’s taste in them. She grew to admire the sleek lines and understated elegance of the old wooden decoys made by the shooting and carving legends of duck hunting’s glory days. Their decoys were tools, meant simply to fool ducks and endure the ravages of hunting the salt marshes and backwater bays of Chesapeake and Barnegat or the coastal waters off New England. They had to be rugged as well as functional. They were never meant to be pretty or decorative or sit on a mantle somewhere. Ironically, that’s exactly where you’ll find many of them today — decorating the homes of wealthy collectors, or on the catalog pages of world-famous auction houses like Guyette & Deeter. Avery reproduction of an Eider duck. The original maker unknown, this decoy was likely carved on Mohegan Island, Maine, around 1900, and sold at a collector’s auction for $767,000. Depending on age, authenticity, rarity and condition, hand-hewn waterfowl decoys now fetch anywhere from a few hundred to several hundred thousand dollars for a single piece. In 2007, a collector paid the princely sum of $856,000 for a circa 1890 merganser hen decoy by renowned Massachusetts carver Lothrop Holmes. Many other listings indicate similar prices are not unusual. Avery’s fascination with their work finally led her to start carving in the style of the old masters. She marveled at their simplistic yet beautifully sculptured lines and strove to capture that quality in her own decoys. She studied their histories and their carving and painting techniques, and began to incorporate them into her own workflow. She became especially enamored of a few specific carvers and began to study their work. Like many artists, Avery spends a considerable amount of time in research before beginning a project. “The internet is a wonderful resource, but if you’re not careful it can really cut into your productivity,” she said. She recalls the time she became interested in the work of Charles Perdew (1874-1963), a carver whose name figures heavily in the world of antique collectibles. Avery wanted to learn more about his crow decoys. “Which,” she said, “led me to research, which led me to the internet, which led me to Pinterest. And that place, for me, is like going down a rat hole.” She’d originally gone into her studio to begin painting, but two hours later she was still on the computer and hadn’t touched a brush. “You can wander endlessly for hours there,” she said. 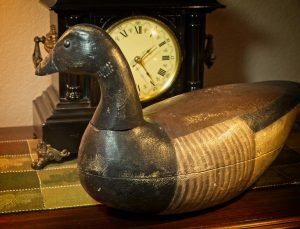 “On the other hand, it can lead to some pretty remarkable encounters.” It was on an internet decoy carvers forum that Avery discovered Syd Wood, another waterfowl carver who, like Avery, shared a passion for antique, hand-carved decoys. More specifically, he was a big fan of Lee Dudley-style decoys, also one of Avery’s favorites. She ferreted Wood out on social media and began corresponding with him. They didn’t know it then, but the two would soon become close friends. This canvasback reproduction was designed, carved and painted by Jan Avery. It is done in the style of Lee Dudley, whose birds — if you can find them — sell for upward of $60,000. Wood is a retired carpenter by trade but an old duck hunter at heart. He started carving in the early 1980s when hunters either bought decoys from known carvers or made their own. He couldn’t afford the prices back then, so he set about learning how to carve his own by reading old books he found in the local library in his hometown of Pocatello, Idaho. He said, as best he could remember, there was only one book that referenced decoy carving, so he checked it out a lot. He made his first decoys from lengths of 2-by-8 construction grade spruce floor joists, but when he realized three of them weighed 15 pounds, he figured he’d better find a lighter wood. As his carving progressed, he became fascinated with the work of the early hunter-carvers and strove to imitate their impressionistic style in size, shape and color. Wood said it was 30 years before he ever met another carver, but in the meantime, he just kept doing his own thing, carving reproduction decoys the best way he knew how. While his working decoys reflected the rustic, minimalist look of the old carvers, he promised his wife he would make her a decorative, fully-detailed, life-size Canada goose for the mantle. In addition to the basic shaping and sanding, it would require hours and hours of meticulous detail work, carving, layering and relieving individual body, wing and tail feathers with specialty hand tools and wood burners. He started the project in 1983 knowing full well it would be extremely time consuming, but it proved to be even more exhausting than he imagined. Nearly halfway through the carving he decided to put the gift goose aside to concentrate on more pressing projects, promising himself he’d return to it in the future, refreshed and reinvigorated. Then he met Avery on the internet, and an incredible friendship developed. “Meeting Jan was a miracle to me,” he said. We live over 500 miles apart, but I feel like I’ve known her since childhood.” He told me how they shared stories of their love for the outdoors, about hunting with their fathers, the bird dogs they’d known and loved over the years, experiences in duck blinds, on pheasant and quail hunts and, of course, their love of carving. They were birds of a feather, brought together by the feathers of birds they both love. Jan Avery works in her studio. 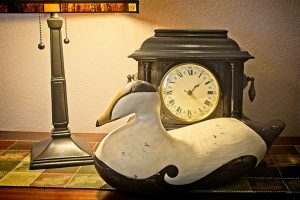 Shortly after they met on the internet, Jan bought one of Wood’s birds — a Dudley-style canvasback from a set of three he had carved. A bit later she bought a second, and Wood decided to just give her the third to keep the set intact. Later she bought a Dudley-style ruddy duck from him. One day, on something like a whim, she sent him photos of a blue-winged teal she carved to see what he thought. He must have liked what he saw because he asked her if she would be interested in collaborating with him on some decoys. He especially admired Avery’s ability to replicate the muted, weather-beaten colors and timeworn patina so characteristic of the old decoys. Together they worked out plans to make reproductions together and make them look as authentic as possible. In the months that followed, they teamed up on several reproductions with Wood designing the patterns and carving the bodies, which he then sent to Avery for painting and finishing. Together they crafted some beautifully finished Harry Shourds brant geese, and an exquisitely executed northern eider goose, among others. This is a replica of a Harry Shourds brant. The original sold at auction in 2003 for $4,541. 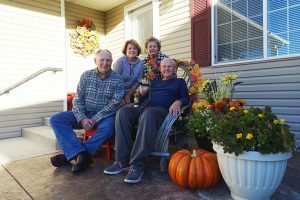 In 2016, Avery and her husband, Dennis, drove out to Pocatello from their home in Windsor to meet Wood and his wife in person. They visited for hours, shared steaks on the “barbie” and spun more duck-hunting yarns and bird dog tales around the grill. Jan Avery and Syd Wood with their spouses during one of Avery’s visits to Pocatello, Idaho. Syd is in the wicker chair holding a cane; Jan is behind him. Wood shipped her the decoy and she began the meticulous task of carving in the dorsal and wing panels and flank feathers. Each one — and there are hundreds of them — had to be individually outlined with a burning tool, then intricately hand carved and relieved to lifelike realism before the painting process could begin. Several washes of acrylic paint were applied followed by the application of complex, finished colors to each feather. Finally, it had to be sealed with several coats of preservative. She finished the gift goose and shipped it off to her friend in late January of this year. It got there just in time for Wood to give it to his wife for Valentine’s Day — a promise kept. In March of this year, Avery got a new bird dog puppy and Wood was still undergoing chemo treatments but had just completed carving three more decoys for her to paint: a redhead drake and a pair of ring-necked ducks. She couldn’t wait to get started. “Syd and I agree God has brought us together for reason,” she said. “I keep him carving and he keeps me painting. We’re birds of a feather.” And, together they created some beautiful ducks to display. Dennis Smith, an avid hunter and fisherman, has written Colorado Country Life’s Outdoors column for more than 25 years.